Before 1961 the US did not run budget deficits. Since then, the upward rise in the cumulative federal debt has the same shape as the rise in cumulative defense spending. 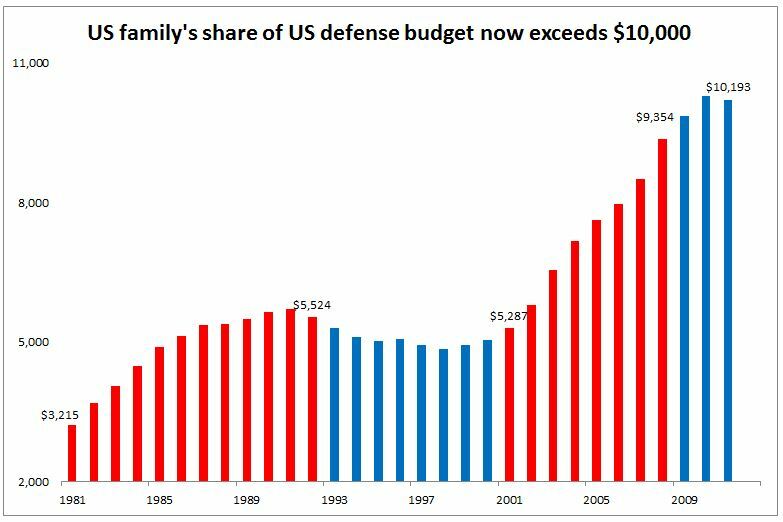 Sources for calculation of a US family’s share of the US defense budget 1981-2011: Defense budget (Bur of Econ Analysis, Table 3.9.5, Gov’t Consumption Exp & Gross Invest, Line 11) divided by the number of US families reported by the US Census Bureau, Table F5, column B. The Republican plan to increase defense spending by $2 trillion means that families will pay even more. Federal defense spending: US Bureau of Economic Analysis, Table 3.9.5, Line 11. Federal debt: US Bureau of Economic Analysis, Table 3.2, Line 46. Social spending: US Bureau of Economic Analysis, Table 3.12, Line 1. Discretionary spending: US Bureau of Economic Analysis, Table 3.2, Line 21. Interest on the US debt: US Bureau of Economic Analysis, Table 3.2, Line 29. Family Households: US Census Bureau, Table F5, Column B.